"Brain mapping using EEG topography has found that creativity and intuition are associated with theta waves usually linked with daydreaming or fantasizing. 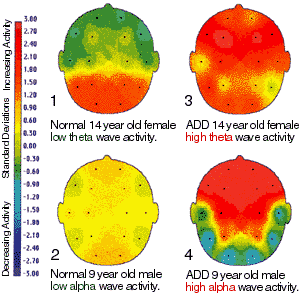 Theta waves are calm states in which intellectual activity at the conscious level isn't occurring. Children and adults with ADHD produce excessive theta waves. Most people, children and adults alike, who see ghosts experience theta waves or brain-wave states of relaxation and meditation. People who practice psychic skills have learned to concentrate in these states and master their psychic ability." One of my constant concerns when I was working as a child therapist was the over medication of young children. As a therapist, I wasn't given an opportunity to question the psychiatrists who are given most of the control in the field, but the standard of care for children who have any problems was to diagnosis them almost exclusively with ADHD and medicate them. Every child I saw in therapy was also being medicated for ADHD, despite the fact that research shows that this medication suppresses growth and causes other side effects. In my opinion, many of the children being medicated for ADHD didn't actually even have it. They had PTSD or adjustment disorders etc., but of course that is another matter. The ones who did have ADHD were often high functioning and performing well in school, but their behavior was a problem so they were medicated because it is a quick and easy fix to children who don't conform. This research brings to light other questions. In a world where ADHD is diagnosed in every other child, could we be suppressing children's potential. There have been links seen between ADHD and creativity and if is Good is right then perhaps there also might be links between ADHD and psychic abilities. Are we suppressing our children's potential when we medicate them into silent, compliant behavior? Are we shutting out the portion of their mind that might let them see beyond the concrete into a more abstract and deep world of ghosts and beauty? I have seen first hand what ADHD was like for my nephew. When he was young he was medicated because of the outburst that later became violent. He found himself in juvenile detention as a boy and later went to prison for possession of drugs and violating his probation. As he got older,he required less medication because he learned how to control his outburst in other ways. Now he is one of the most creative artist I know and a wonderful father to his son Gabe. I think the medication is suppressing some children's abilities but sometimes it is needed. I hated all the meds he had to take and hope they come up with better ways for those to live with this disease. You are so right. There are some children that definately need it. It can change everything for those that need it. Its just that sometimes there are those that don't. It important to know the difference. Caron, I will definately post a review once I'm done reading it. It is a very interesting book so far. I can't wait to learn more! I had ADHD as a child (I think I've grown out of a lot of it), and I saw a ghost when I was about 13, during a session of meditation. Long story short, it came up through the floor while I was meditating and in a state of calmness, and I believe that it was drawn to me. however I thought this put up used to be good. I don't understand who you might be but definitely you are going to a well-known blogger in case you are not already. Cheers! I am an undiagnosed adult with ADHD, in other words "no meds to date" and I'm 37. I see all sorts of things all the time but can switch that off at will. What I struggle with to this day is the amount of things I feel (emotions of others and knowing others intensions from all sorts of worlds, this one included). This has led me from being a boisterous loud, energetic and uncontrollable child to a recluse of sorts who can't hold down a job. Anyone else had this issue and managed it, it's getting more intense all the time and I'm in overload and very close to the point of taking my own life. Benjamin... Could you please email me. My address is Jessica.penot@gmail.com.